"Add another one to the list," my dad said as the nurse wheeled him back into the room. Rolling my eyes heavenward and with dread, I asked, "Why?" "Oh, I was waiting forever for my MRI, and this tech was complaining to the other techs about how bad of a day she was having. What a bad week...life...and she just went on and on while I just sat there waiting for her to tell me to get up and into the MRI machine. Then, when she was good and ready ~some 30 minutes later~ she told me to get up there." "Oh, no," I thought, then prompted him, "And?" "Well, she was so caught up in her 'bad day, week, life' that she forgot to ask me if I had any jewelry on." I closed my eyes and shook my head. This wasn't my dad's first MRI by any stretch of the imagination and he had come back from the MRI alive, so I knew he had done something, if not nefarious, it was definitely going to be mischievous. "So what did you do?" I asked and silently added the word "now." "Well, while she was helping me get down from the MRI and into the wheelchair, she suddenly remembered what she forgot to ask me before the MRI, and she started to panic and then asked me if I had any jewelry on." "Oh dear God," I thought. Then asked, "And?" "So I told her that yes, I had a big necklace on with a big cross. And while I was in there, I saw an arc of electricity," my dad explained. "Then she really looked upset. She looked like she was going to cry, so I quickly told her I was joking and that if I had had any jewelry on before the MRI, I'd be dead now." "Oh my God, Dad. You didn't." With a big smile on his face he replied, "Yes, I did, but I think I pissed her off, so we need to add her to the list with the rest of them. And she's going to need chocolates, too. Don't you think?" Rolling my eyes heavenward, I replied, "It sounds like it, " and then I had to ask, " Why'd you do it?" "Because I was tired of hearing her complain about how bad her life was while I sat there waiting to take that stupid MRI to see how big the tumor is in my brain. And she needed cheering up," he explained. "Oh okay.," I thought sarcastically. So, I added her to the list. The list that contained the names of medical personnel that Dad had somehow offended in this hospital stay. A hospital stay that was keeping him away from his sweetheart on Valentine's Day. My dad wasn't usually a difficult patient, but I think he got bored a lot of the time, and he expected the medical personnel that he dealt with to be "real" people when they entered his room. And maybe he'd throw in a joke or two. Also, he'd always ask the nurses and other medical personnel what kind of grades they made in school. I always found it humorous to watch their faces when they realized he was serious. He'd say it in a joking way, but he was definitely serious. He'd quiz them on why they made anything less than an "A", and he really wanted an honest answer. I once asked him why he wanted to know, and he answered me with this question, "Why would I want someone working on me that made less than an 'A'?" Made sense. But this particular visit had my dad really stressed out. I mean, here he was on Valentine's Day in a hospital while his sweetheart, my mom, was seven hours away, and they had found a tumor in his brain, which meant that his kidney cancer had spread. Again. And he was going to need brain surgery to remove it. Heavy and serious stuff, and also the reason why Dad was so stressed and cranky this time and the reason for "The List." And that's why my sister and I went to the local drugstore and bought Valentine's cards and candy for those he'd been a little less-than-cordial with. [Get it? Cordial. I wonder where my sense of humor comes from. Hm...] There were enough names on the list to warrant a box of value-pack cards, and when we brought them back to him in the hospital, he wrote on each one an apology and a wish for a happy Valentine's Day. Pretending we were cupid, my sister and I spread his apology throughout the hospital with cards and chocolates. My Dad really did have a big and generous heart, and a lot of the time he worked behind the scenes to help people. He didn't do it for the glory. He just did these things from his heart because he felt they needed to be done. He made an impression on not only people, but people's lives with his acts of generosity. So, when I was looking up the history of Valentine's Day, I was struck by what I'd found on Wikipedia. It indicates, "the feast of St. Valentine was first established in 496 by Pope Gelasius I, who included Valentine among those '... whose names are justly reverenced among men, but whose acts are known only to God.'" And that's kind of like my Dad. I only know of some of his acts of generosity. And the rest? Well, those are between him and God. What a loving tribute to your dad, Caroline. I enjoyed reading it. Thank you for sharing your special memories with us. Outstanding Caroline, I love this story about your Dad, he would be the type of Dad I would love to be around. Thank you so much for giving us what "Valentines Day" truly means and "No more Bad days!" Such a beautiful story you have shared with us about your Dad - thank you! 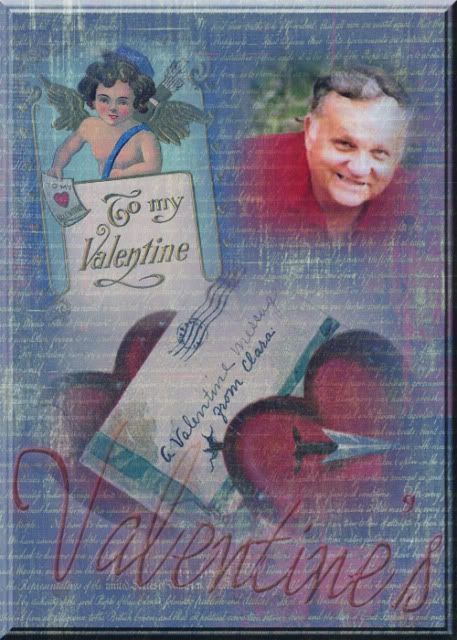 A funny valentine, with a heart-full of cordial reminders! Gives me heart happiness. This was a very moving story about your Dad, thanks for sharing. What a sweetheart - thank you for sharing this story with us! I second that. Yes, you are so gifted...particularly when writing about your Dad. Wonderful! What a beautiful Valentine story . Thank you . Thanks so much for sharing about your Dad, Caroline. Very special!